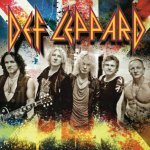 Def Leppard played a show at the Fontes do Sar in Santiago de Compostela, Spain on 28th June and the setlist has now been confirmed. The band did indeed play only 17 songs and the order of these has now been confirmed. 8 songs were played from the Hysteria album and 'Women' was used as the show opener for the first time ever. 'Animal' was played earlier in the show as it has been in recent years (outside of the UK) and 'Let's Get Rocked' ended the main set. 'Make Love Like A Man' returned the the set for the first time since April in Las Vegas. Both 'Mirror, Mirror' and 'Wasted' were dropped. Thanks to Garcia for confirming the exact order. The next show takes place tonight in Helsingborg, Sweden. Moved to an earlier spot in the show from its usual place near the end of the set. Moved to a later slot as the main set closer.